Note: This lovely book is now available in the US as Out of This Place. Emma Cameron’s Cinnamon Rain embodies the Trifecta of Awesome in my reading heart: a contemporary older YA, Novel in Verse, from Australia. Fortunately, after a long (very, very long) wait for my order of this book from Fishpond, the Trifecta of Awesome didn’t disappoint—Cinnamon Rain is one of my stand out reads of the year. 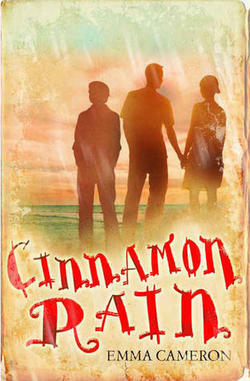 Cinnamon Rain interweaves the stories of three friends: Luke, Casey and Bongo (yes, Bongo—his real name is David). They live in a rural town in Australia, each hoping to escape their lives. Luke plays cricket, hangs out at the beach and pines away for Casey. Casey’s dream is to escape their town and everyone she knows, while Bongo drinks to avoid his abusive stepfather and the memories of his little brother taken away by social services. Each character narrates a third of Cinnamon Rain (this seems like a more common narrative style in Australia than in the U.S. or U.K., am I right? ), painting a rich picture of three lives in transition. We follow them separately out of their hometown in their first steps into adulthood. she’s not just running away. What’s most remarkable to me about Cinnamon Rain—aside from the writing, which I’ll get to in a minute—is that the characters are in Year 10 (the Aussie equivalent of sophomore year), but it read as very universal. The characters could have been far older and the story of Luke, Casey and Bongo would have rang just as true. As someone who grew up in a small community in Oregon, I instantly connected with Luke, Casey and Bongo’s experiences, and I think anyone who’s every wondered, “What else is out there?” will instantly see a bit of their own experiences in the story of these three Australian friends. Cinnamon Rain doesn’t tie anything neatly up with a bow as is often the case young adult literature. [This is where it gets hard to talk about the book without being spoilery.] I had very much hoped for a certain outcome, and that outcome wasn’t what happened. However, therein lies the beauty of Cinnamon Rain’s story—it made me root for something to occur, but when that didn’t happen, I felt satisfied nonetheless with the realistic resolution. And really, the conclusion of the novel stays true to the theme of new beginnings. Frankly, if I had to say anything critical, my only issue with Cinnamon Rain is that I didn’t really understand why the two male narrators were so enamoroured with Casey. I loved the section of the novel from her point of view, and I kept thinking that I wanted to hit Luke and Casey over the head with a cricket bat (are they called bats in cricket?) for not understanding that she needed to get out of town and just live. But, that’s also Cinnamon Rain’s strength—the trio’s relationship is such a small town reality (think Tim/Jason/Lyla in Friday Night Lights). bubbles reaching everyone around her. Cameron’s debut (and, gosh, it sure doesn’t read like a debut—this is one sophisticated novel) is written in free verse, which I love. I know there are folks out there who cannot stand free verse, and I completely understand why it may seem like just a bunch of disjointed sentences strung together. However, free verse is so much more. Like all successful free verse novels, Cinnamon rain is rich with metaphor and intriguing literary devices. It’s about (as Laura referenced) the “space between the words” as much as the words that are present. There’s a continuity between each verse that works brilliantly (I leave it for you to discover). With this type of free verse, you’ll find yourself savouring the words, the descriptions and the rhythm of the story. Don’t expect bloated poetic writing, however. The writing in Cinnamon Rain is quite sparse, which is an engrossing contrast, as it is also very visual and emotive. Sadly, Cinnamon Rain is only published in Australia. That means that if you want to read this marvelous novel in verse and you’re not in Oz, your only option is to order from Fishpond. I know that Maggie has had great luck with them, but it’s not been a great experience for me—I think it took over six weeks for this book to ship and I was constantly bombarded with mysterious emails about how it would be sourced and dispatched soon and my bank flagged their transaction as non-PCI Compliant and potentially fraudulent. Anyway, despite all that, Cinnamon Rain was wholly worth the wait and annoyance as it is a remarkable little book and one of my favorite 2012 debuts. FNL Character Rating: That strange, often uncomfortable, yet ultimately compelling Tim/Lyla/Jason relationship, with Tony Lucca’s unforgettable rendition of Devil Town as background music.